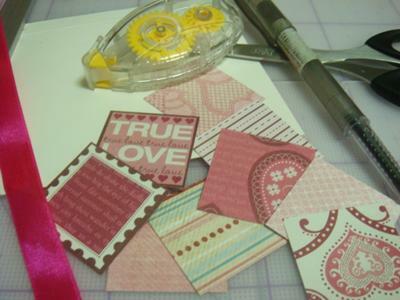 Score your white cardstock in half to make a square card that measures 4.6in x 4.6in. 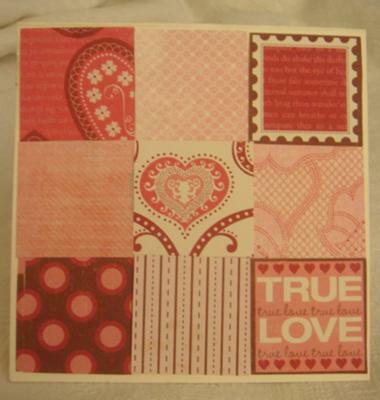 With your spare patterned papers, cut 9 1.5 in x 1.5 in squares. Make sure that the colors of the different papers go well together. Try to put the square papers side by side, and see how they look together. Move the squares until you find a comfortable look. 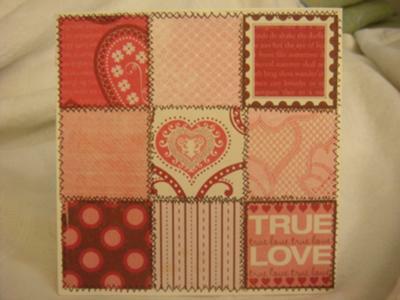 Adhere each square on the cardstock. Make sure each square is adjacent to each other. Your card should now look like this. You can actually stop here as it already looks like a patchwork. But, for more effect, I added faux stitches by putting small x’s on the edge of each square. Now it looks more like a patchwork, doesn’t it?